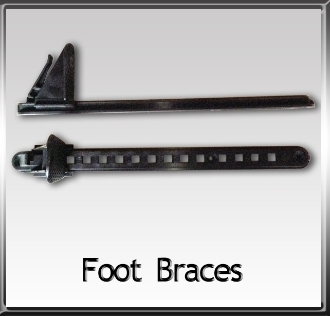 The Keepers Foot Brace Kit is the most commonly used footbrace in the world. These OEM replacement footbraces are lightweight and easy to adjust. 15" overall length tracks use universal mounting hole pattern. Perfect for skin on frame kayaks. We have used over a 1500 sets, and yet to see one fail. Installation hardware not included. The rails are 15 5/8 inches long by 1.5 inch wide, by 5/8 inch deep. Bolt holes on ends are 14 5/8 inches on center, one additional hole off center.